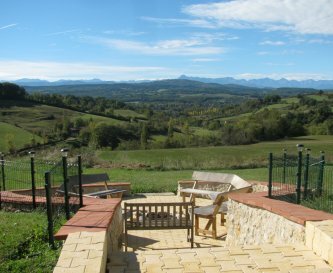 Manzac d'en Bas, Castex, Ariege, Midi Pyrenees, France, sleeps 4-18 in 9 bedrooms. 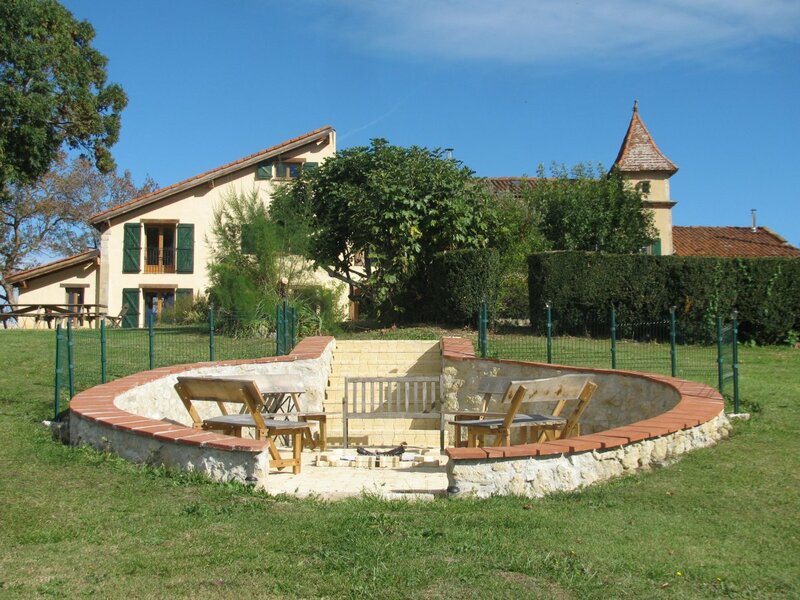 Manzac d'en Bas is the ideal place for a family summer holiday (including three generation holidays) or a big group celebration such as a birthday or wedding anniversary. 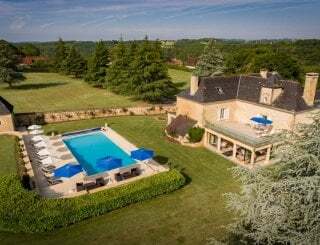 Manzac d'en Bas consists of three very spacious gites - L'Ecurie (which can sleep up to 4 people), La Grange (up to 8) and Le Logement (up to 6) which have all been renovated to a high standard and combine traditional charm with comfort and modern amenities. In total, there are 3 kitchens, 3 sitting rooms, 9 bedrooms and 8 bathrooms. 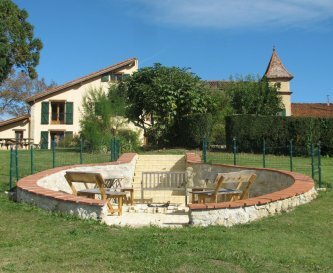 The gites can be rented individually, but a group booking taking all three gites results in exclusive use of Manzac which may be preferable. 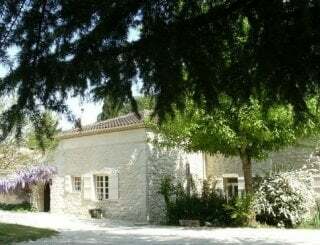 In addition, during the mid season months of May, June, Sept and Oct, the gites are available for activity holidays - such as painting and yoga. 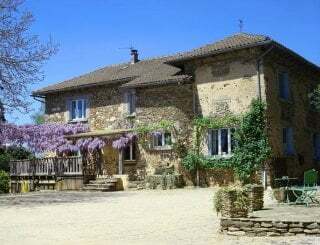 Manzac d'en Bas is set in truly beautiful countryside with stunning views. 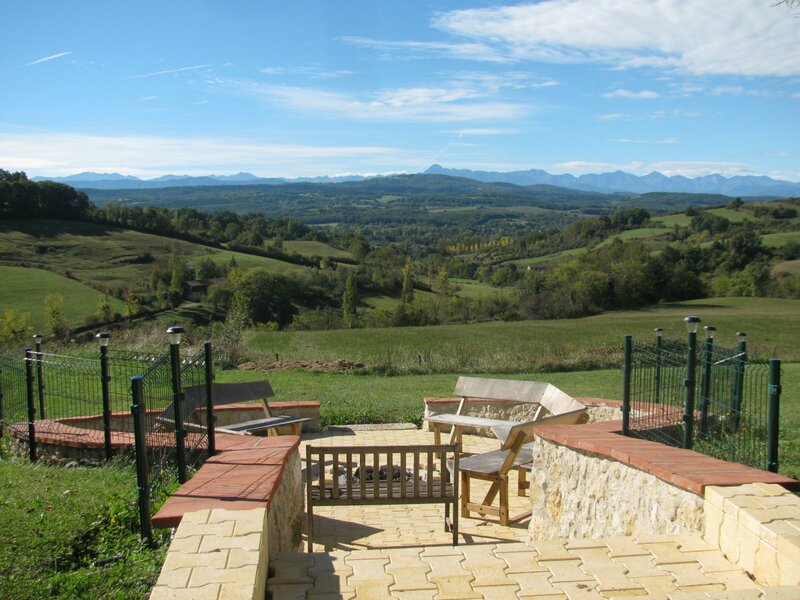 It is extremely peaceful and relaxing and while it appears to be relatively remote, it is in fact near essential amenities, (supermarkets, restaurants) and lots of great things to see and do, and less than an hour from Toulouse, a really lovely city. Alternatively, it is the perfect place to relax and unwind, including next to the swimming pool. 1. Everyone has their own separate spaces for certain activities (childrens' supper, watching a film, childrens' bathtime for eg) or relaxing in peace and quiet. 2. Three fully equipped spacious kitchens make it easier to prepare meals including 3 fridge/freezers, 3 cookers, 3 dishwashers. 3. Three separate hot water systems mean you never run out of hot water! In addition, the facilities on offer at Manzac d'en Bas include a 13x6m swimming pool, a studio/summer games room, a 'braai' fire pit, barbecues and a two acre garden with a variety of outdoor spaces to relax, play, eat and socialise. There are 3 fully equipped, spacious kitchens all with dishwashers, cookers, fridge freezers. There are 3 dining rooms, 2 of which can seat up to 14 people each. Ideally, in summer, everyone will be outside where there are ample facilities. There are 3 separate sitting rooms, all with a TV monitor, DVD player, books, games and children's toys. Each gite has a TV screen and a DVD player and an HDMI cable (for Netflix for eg). There are CD players, though streamed music is now more convenient. 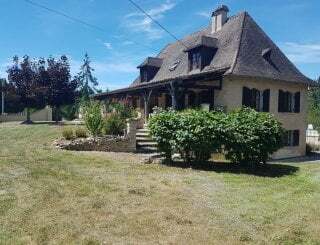 The gites have WiFi connection throughout and good mobile phone coverage at the front of the gites and in the garden/swimming pool. There is a 50m2 games room with table tennis. This room, which is separate from the gites, can also be a party room for music and dancing. Each of the gites has a wood burning stove (although they are not normally needed in summer!). In total there are 9 bedrooms (3 doubles, 4 twins, a triple and a single room) All en-suite except the triple and single rooms which share a bathroom. All linen, including bathroom and swimming pool towels, are provided and are included in the price. There are eight bathrooms - 7 are en-suite, and 1 bathroom for the triple and single room (childrens accommodation). There is a ground floor twin bedroom with an en-suite shower room for anyone who has difficulties with stairs. Cots, high chairs, stair gates are all provided on request. 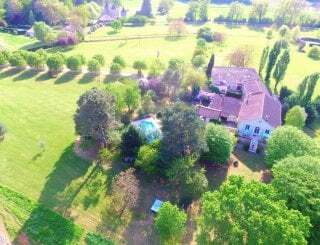 Include a swimming pool, a braai (fire) pit, 3 terraces in a 2 acre garden, ample garden furniture, including benches, sun loungers, hammocks, tables. 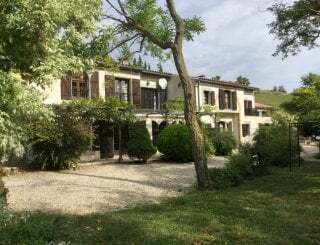 A 13mx6m salt water swimming pool surrounded by 225m2 of terracing, with shade sails, umbrellas, sun loungers and chairs and views to the Pyrenees. 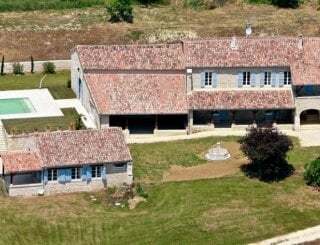 There is ample parking at Manzac d'en Bas with space for 8 cars. There is a no smoking policy in the gites, but smoking is permitted outside. Generally pets are not permitted, but may be allowed on a case by case basis - please enquire. Manzac d'en Bas is an hour south of Toulouse in the Ariege Department of SW France and half way between Toulouse and the Pyrenees Mountains. Daumazan sur Arize - 5 minutes away, Montesquieu Volvestre - 15 minutes away. 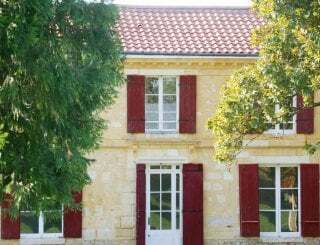 Daumazan sur Arize - 5 minutes away, Bordes sur Arize - 10 minutes away. Daumazan sur Arize - 5 minutes away. We charge in euros - currently 3880 euros per week which equates to less than 30 euros pppn. We ask for 25% at the time of booking and the remaining 75% eight weeks before the holiday starts. Changeover normally in Saturday, but discounts for group arrival on Sunday and/or departure on Friday. Toulouse (TGV) - 1 hour away. No buses - need own transport when staying at Manzac d'en Bas. Toulouse - 1 hour away, Carcassonne - 1.5 hours away.